Tactility is especially important in today’s day and age, as we’re in constant competition with a world full of screens. 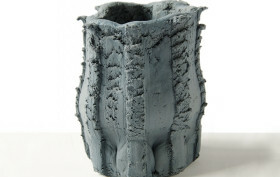 That is the beauty of Floris Wubben‘s Pressed Objects; they aim to bring back textures to our day-to-day life. Made from pressed epoxy clay, the objects come in the shape of vases, flowerpots, and recipients, all created by a coalition between the hands and a machine. 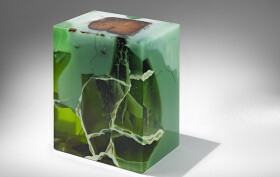 Turin, Italy-based design collective Nucleo has developed a series of extraordinary stools they called “Jade.” Created by director Piergiorgio Robino, these unique cubic pieces were made by submerging organic material into a mold full of a liquid polymer. The technique evolved from the studio’s previous works, but the difference lies in the precious color and the embedded log, which was part of a 200-year-old oak tree.